In the wake of yesterday’s tragic violence in San Bernardino, let us be reminded of a powerful passage in the Holy Gospel that teaches us about the ultimate powerlessness of violence. Judas then, having received a band of men and officers from the chief priests and Pharisees, cometh thither with lanterns and torches and weapons. Jesus therefore, knowing all things that should come upon him, went forth, and said unto them, Whom seek ye? They answered him, Jesus of Nazareth. Jesus saith unto them, I AM he. And Judas also, which betrayed him, stood with them. As soon then as he had said unto them, I am he, they went backward, and fell to the ground. Then asked he them again, Whom seek ye? And they said, Jesus of Nazareth. Jesus answered, I have told you that I am he: if therefore ye seek me, let these go their way: That the saying might be fulfilled, which he spake, Of them which thou gavest me have I lost none (Jn 18:3–9). Verse 6 is amazing in its power. It tells us that, when the Jewish soldiers asked for Jesus, His mere words, “I AM He” caused them to recoil and fall to the ground in fear and trembling. Let us prayerfully meditate on this. Undoubtedly, these soldiers were seasoned by war and various battles. The Jewish leaders who sent them chose a qualified band of men who would be sure to arrest our Lord, Whom they made their greatest enemy. Nonetheless, with only three words from Christ — “I AM He” — they fell back and cowered in fear and trembling. The Holy Psalmist David prophesied concerning this very moment: “When the wicked draw nigh against me to eat my flesh, they that afflict me and are mine enemies, they themselves became weak and they fell” (Ps 26 LXX). Why did these hardened Jewish soldiers react in such a way? Then Simon Peter having a sword drew it, and smote the high priest’s servant, and cut off his right ear. The servant’s name was Malchus. Then said Jesus unto Peter, ‘Put up thy sword into the sheath: the cup which my Father hath given me, shall I not drink it?’ (Jn 18:10). When the Holy Apostle Peter, in his misplaced zeal, attacked and successfully struck off the ear of Malchus, the servant of the high priest, the soldiers did not fall back in fear. Peter intended his violence to have an impact, to make a change in that dreadful circumstance of the Lord’s arrest, but he failed. The Holy Gospel records no impact from his act of violence. With no other weapon than His own solitary voice uttering the words “I AM,” He knocked down, repelled and rendered helpless that great crowd, even with all their ferocious hatred and terror of arms. For God lay hidden in that human flesh, and eternal day was so obscured in those human limbs that He was looked for with lanterns and torches to be slain in the darkness. “I AM,” He says, and throws the wicked to the ground. And this was like a thunderbolt to His enemies. They went backward, which happens when one is at war with one’s enemy who, being thrown into confusion, fearfully seeks to save himself by fleeing. Moreover, they fell to the ground, so terrified had they become. Whether it was the Person of the unparalleled Righteous One, so great even in the eyes of His enemies, that struck the impure consciences of those who had come to commit the crime, or whether it was the special, wondrous might of Christ acting there, the Evangelist does not tell us. But it is obvious that the greatness of Christ Jesus was revealed before the face of His enemies in a brilliant light; it is clear to each and all that in the presence of His will the designs of His enemies were but as a spider’s web. Where, then, was the real power on that night in the Garden of Gethsemane? 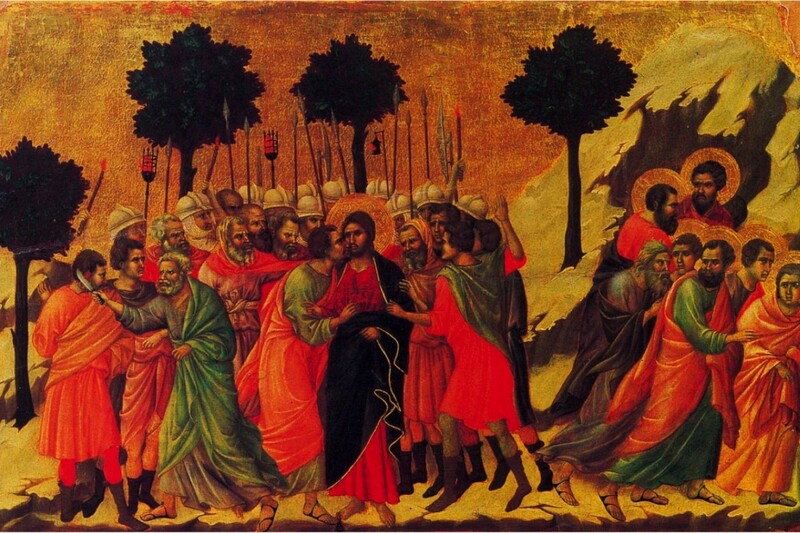 Was it in the violence of the soldiers coming to arrest our Savior under the guidance of Judas the Betrayer? Was it in the violence of Peter who successfully struck one of them? No, there was no real power in these acts. Violence is not nearly as powerful as the knowledge of God. The true power of our Savior was manifested in the events following Gethsemane, when the Light of the World accepted to undergo the darkness of His Passion, Crucifixion, and even Death itself so that He might be victorious over satan, sin, death, and all the hosts of darkness. Let us therefore condemn violence and pray for the perpetrators of violence as we strive to know, imitate, and be united with Christ Who manifested true power in His life-giving work on the Holy Cross. 2 Responses to "The Ultimate Powerlessness of Violence"
Glory to God! May He teach and help us deal with this tragedy.